Holes? How do you drill in aluminium? Can anyone tell me the best way to drill holes with a shapeoko in aluminium? I’m having real trouble. I have 1/8 drill bits that cut metal like butter in my drill. I did a project today where I wanted to drill 8mm ali. Within 3 holes the bit snapped - tried another time - also snapped. Issue is even at 5mm a min the drill is still spinning at 16000 rpm? I’m using the drill function is fusion 360. With my Nomad, I “drill” holes by milling pockets with a smaller end mill. I use the same speeds and feeds as I do with other Al milling. I have to tell F360 that I want tighter radius ramps. I will try 1mm a min plunge rate. I’ve tried the other methods but not had a huge amount of luck. How deep are you going? I’ve done through holes in 6.35mm and 2mm aluminum with a 3.175mm, 3 flute end mill. 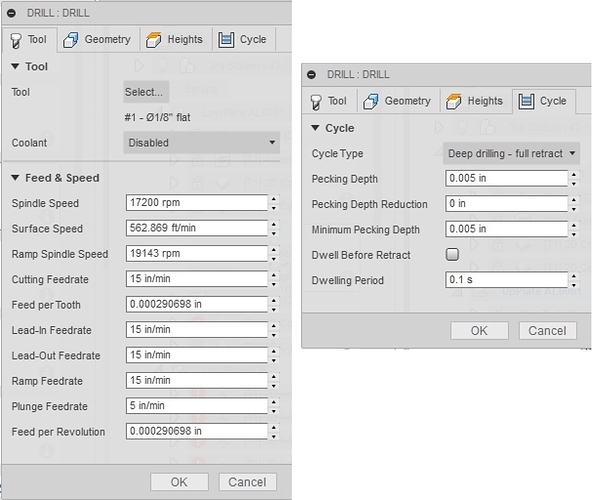 I use the F360 drilling option ‘Deep drilling - full retract’ even though neither are that deep. One thing about drilling aluminum with an end mill is you need to consider what you’re using as your waste board. I use hardboard which is actually pretty soft. Since the aluminum is also quite soft it tends to compress and stretch easily. This means when you try to do through holes with an end mill you need to dwell a bit at the bottom and also set a break-through depth so you punch through the stretch as you go through the bottom. I usually use speed setting 2.5 to 3 on the Dewalt, 50mm/min plunge, .25mm pecking with a .2 sec dwell period. Also set the break through depth to .5mm past the bottom of the stock. 1/8" drill bit (3.2mm) at 16000RPM, 5mm/min is a bit out of range. The surface speed is 150m/min (500ft/min), which is a bit fast w/o a flood or through the tool coolant, but not too fa out of the range. The feed is 0.3micron/rev (0.012 thousandth of an inch), which is a very, very light feed. The bit will rub, then grab, then rub, then grab… Without coolant, the bit will heat and dull, then break. Too low a feed will dull and destroy a tool faster than too high a feed. I’d slow to about 4000RPM (40m/min, or 125ft/min, the low, low end for most aluminum’s, but this is about a three diameter hole depth, so low end is good), bump the feed up to about 50mm/min, and go with about 3 or 4 pecks per hole to clear chips. This will give you about 12micron (0.5 thousandths) feed per revolution, which is still a bit light (about 50micron, 2 thousandths, is recommended by most sources for 1/8" bit), but in the range for a continuous cut so the chips take the heat out. The pecks should retract to clear chips when the drill has cut roughly the drill diameter or a little less, and as the hole gets deeper than about three times the drill diameter, more often to reduce heating and wear from rubbing. 8000RPM would be right in the groove for a 1/8 drill, but the feed might be excessive for the machine, especially with the need to peck. Others with better knowledge of the machine may have a different view (I have a nomad, not a shapeoko), but I think machine rigidity and the spindle are your limiting factors here. If you can not slow the spindle, then you are looking at feeds in the range of 200 to 400mm/min, or you will need a good coolant, or both. It is slower to mill them out with a smaller diameter bit but it’s far more precise. Typically a drill bit will make a hole slightly oversize, especially if in a drill chuck which will always have worse runnout than a spindle. The holes for the magnets on this were made by milling a circular path with a smaller dia cutter than the hole dia. The holes were size for size so I eased them out in 0.1mm incruments untill the clearance was perfect for the cyanoacrylate glue. So I’m drilling clean through the aluminium and I’m setting an addition -1mm on the hole height to compensate for flex etc - I have this going into a plywood board and this is on my Aluminium table. I would slow the drill bit right down, but use a dewalt 611 router which can only go down to 16,000 rpm I believe? Perhaps I should look into the peck drilling - I have had varied success in the past using mill end bits and treating holes as pockets and milling them out. When milling aluminium usually I would drill the hole then mill after - for example a 5mm hole is drilled using a 1/8 drill then milled using a 1/8 bit to clear it - this puts far less strain on the 1/8 mill bit later on. I think I will try a low spindle speed of 1 or 16000 rpm, peck drill at 40mm a min with 1mm DOC per peck. If I can add a delay I will. I forgot to mention - @1st_Kiwi_Nomad - I very much like your box. I’m waiting on some nice walnut to make something similar. I haven’t had any issues drilling wood, like I have with aluminium. Straight flute drill bits, a peck cycle, and coolant flood the hole if possible. …I too like to pocket mill holes (mostly because I don’t like to change tools ), but sometimes smaller cutters aren’t long enough for how deep you need to go. I will try to shot a video showing the operation. Interesting - what style bit are you using there? looks very small? Drill bits are not intended for use at the speeds which a router spins. Please don’t use them unless you have a means to limit the R.P.M. to speeds w/in the manufacturer’s guidelines. Also, the machine doesn’t have sort of vertical leverage a drill press has, nor the positional rigidity — that may be part of the problem as well. Please research what you are doing, consider the specifications and nature of the machine, and adjust accordingly — I would suggest using a real endmill as intended for the machine and adapting tool path strategies accordingly. I though as much, but people told me not to use mill bits! And yes the machinists will laugh at you when you tell them you are drilling with endmill. But we are hoppiest are looking for the best way to do the part as accurately as we can with the machine capabilities. Another suggestions don’t go deeper than 1/8in when using 1/8endmill, which you can use it as drilling spot.